Acute cerebellar ataxia occurs after prodrome of fever, gastrointestinal illness, respiratory illness and rash within 3 weeks prior. 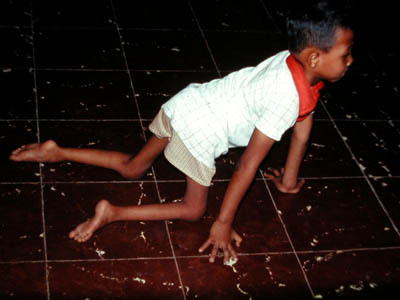 Acute cerebellar ataxia is common causes of acute childhood ataxia which affect children age 2 to 6 years. The common symptoms and signs of acute cerebellar ataxia are wide based drunken gait, and refusal to walk mostly in children and irritable. The complication of acute cerebellar ataxia may include learning problems, speech abnormalities and eye movement abnormalities. The common differential diagnosis of acute cerebellar ataxia are trauma to the head and neck, increased intracranial pressure, toxic cerebellar syndrome, posterior fossa tumor and acute demyelinating encephalomyelitis. The treatment may include IVIG and supportive treatment.